There’s a subtle, debilitating disease that affects almost everyone in sales. It can go unnoticed for weeks, months, or even years. For example, many salespeople have outgoing, talkative, emotional, enthusiastic personalities. And they sell in a way that feels most “natural” to them. Every time they get on a call, they sell in a way that they would like to be sold to without thinking twice about it. Most salespeople don’t think about why they’re saying what they’re saying. An outgoing, emotional personality is great when you’re selling to a decision maker who also has that personality. But what if your customers are more reserved or analytical? What if they’re less willing to take risk or are less optimistic? In situations like this, going on “autopilot sales mode” can cripple your close rate. The best salespeople modify their script to their audience members based on their personality. They understand the same tone and delivery style won’t always work for two different customers. They know different types of customers need different buying experiences. By understanding which DISC archetype most closely matches you and your prospect, you’ll know which strategy and presentation style to use. In this post, I’ll show you how you can grow your sales by using the DISC framework. The first step in figuring out how to adapt sales presentation to your customers is first understanding your own personality type. 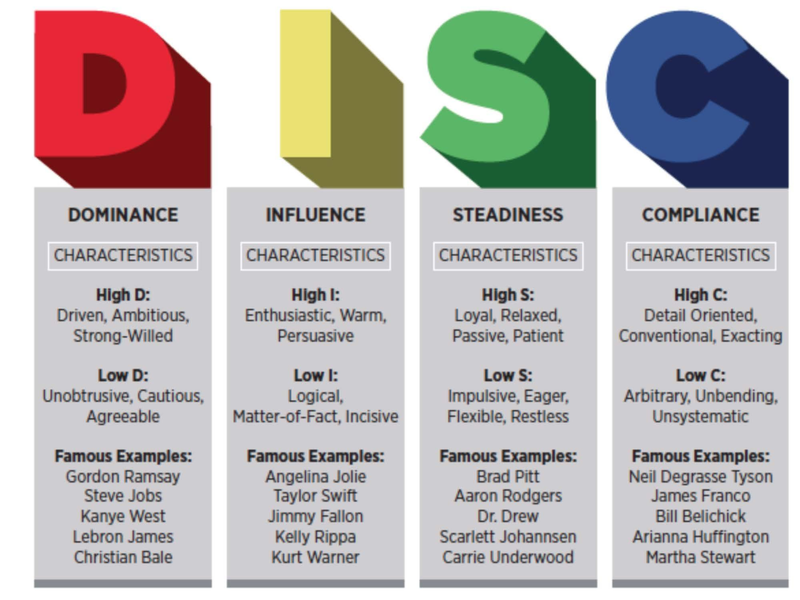 DISC is broken down into four archetypes: Dominance, Influence, Steadiness, and Compliance. “Dominant” (D) people prioritize results over everything else. They care most about their bottom line and are very direct in their communication. “Influential” (I) people care most about influencing or persuading others. They put a lot of weight on their relationships. “Steady” (S) people emphasize security. They look for sincerity and dependability over anything else. “Compliant” (C) people want as much information as possible about your product or service. They value quality and accuracy and are afraid of making the wrong move. Dominant people are highly driven and ambitious, with anger being their driving emotion. They’re also extroverted, task-oriented, and occasionally impatient. Influential people aren’t afraid of being the center of attention. If you’re the Influential type, you’re probably enthusiastic about what you do, talkative, and extroverted. Steady people are frequently reserved or non-emotional. These people crave security, are resistant to change, and prefer working on one or two tasks instead of several. Compliant people are very accurate, precise, and detail-oriented. They’re naturally cautious and rely on calculated data-backed decisions rather than gut feelings. Once you figure out your own DISC profile, you’ll have a good sense of your strengths and weaknesses when it comes to selling to other personality types. Most salespeople naturally sell to their own personality type instead of thinking about the personality of their customers. For example, if you have a high “D” personality, you might become impatient with someone who’s an “S” who prefers to take an interaction more slowly. If you’re an “S” selling to a “D”, you might get turned off by their direct and confrontational approach. If you’re an “I” and you’re selling to a potential customer who’s a “C,” you might try to sell to their emotions or feelings when they want facts and data. HIgh “D” people typically move fast and always on the go. They’ll talk with their hands, using big gestures. They’re not enthusiastic about small talk. Sometimes, they can give the impression that they’re rude or hard to deal with. High “I” people are typically trusting and optimistic. They use lots of facial expressions and hand gestures while they talk. High “S” people tend to keep “poker” faces and don’t display much emotion. They’ll talk and walk with a steady, easy pace. High “C” people will ask direct, detailed questions. Their classic body language is having their arms folded, with a hand on their chin. You can figure out the main personality type of your potential customers within the first few minutes of an interaction based on how they respond to small talk, the first questions they ask you, and their body language. Once you’re aware of your personality type and know how to identify the personality types of your customers, you can adapt your sales techniques to resonate with them. If you’re selling to a high “D” customer, show you respect their views and requirements without making them feel like you’re simply agreeing to whatever they say. They’ll view that as a sign of weakness. You should also avoid focusing on them personally, and stick to the facts at hand. Dominant people are strongly influenced by other people who they perceive as having high status or power. When possible, use testimonials from well-known people in your industry. “I” personalities like to talk about their ideas and emotions, so ask them what they’re thinking and feeling. Let them vocalize what’s working and what’s not. They can also be disorganized and avoid details, so providing summaries or takeaways of what you discussed can help them focus on what you want them to focus on. But only include details that are absolutely necessary. People with high “S” personalities are even-tempered, composed, and good at listening. Show them you’re interested in who they are as a person, and don’t let your sales pitch feel too “transactional.” Make it clear you value the relationship. If you focus too much on facts and numbers, you’ll risk coming off as impersonal. People with high “C” personalities like having as much information as possible. Give them the information from your verbal pitch again in writing. Knowing they can review all the documents later and make an informed decision puts “C” people at ease. Having a detailed pros and cons list in your proposal can also help them make a decision. Compliant people are very afraid of making the wrong decision, so offering some type of guarantee or refund can help ease their worry. Many salespeople sell in a way that feels most “natural” to them, which usually means selling to their own personality type. That’s why most pitches tend to have inconsistent results. If you’re able to adapt your pitch on the fly to the personality of your customer, you’ll consistently exceed your quota. Want a visual guide to using DISC to sell? Download this handy resource.